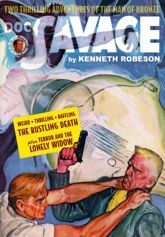 The pulps' greatest superhero returns in action-packed thrillers by Alan Hathway and Lester Dent writing as "Kenneth Robeson." First, Ham Brooks is rendered helpless by a strange sound, a rustling noise that can destroy planes in midair and disintegrate entire populations! Then, after his cover is blown during an undercover mission, the Man of Bronze heads to the South Seas to avert an atomic age threat in one of his most gripping postwar adventures. This instant collector's item reprints the classic color pulp covers by Emery Clarke, features the original interior illustrations by Paul Orban, and includes historical commentary by Will Murray (author of fifteen Doc Savage novels).